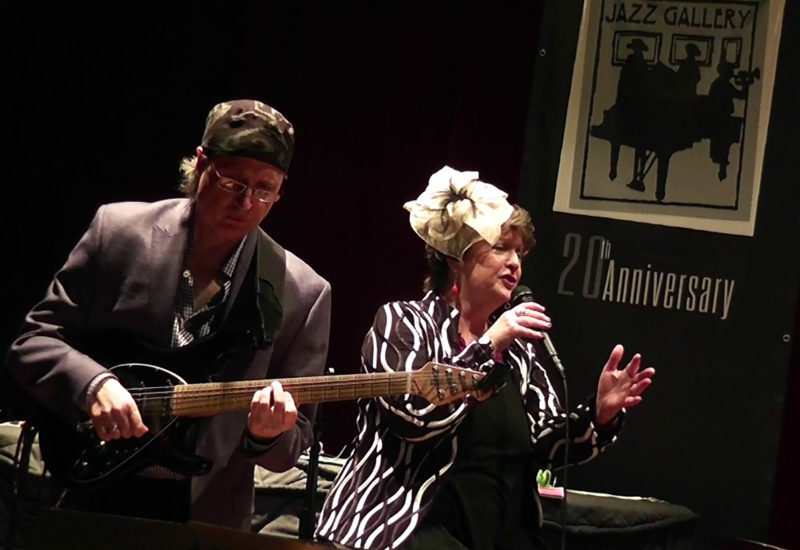 Please find below live streaming of our CD, video, photos, links to bios and associated downloads for Judi Silvano and Bruce Arnold’s Projects. They move back to somewhat more familiar territory on “Complete Embrace“, but with neat and crispy little “bells” and superb synth sounds that compliment Judi’s silky smooth vocal very nicely… of course, the tune clocks in at a full 9:35, so that gives them more than enough room to explore each others’ creative genius… a relatively simple tune that will transport you (by the end-note) to symphonic (and hallucinatory) bliss! The title track, “Listen To This“, is short (2:43), but there’s no doubt you’ll be flashing back to territory you thought you’d long left behind… if you’re like me, you’ll be hitting the replay button often on this one. It is the (almost) “spoken-word” cut, “Journey To Be Free“, that (easily) gets my vote for personal favorite of the dozen sonic adventures offered up, though… hearing the transition from “out there” to “completely clear” on this tune will restore your faith in the real, and help you realize that “different” is often “better”. I give this totally-talented duo a MOST HIGHLY RECOMMENDED, with an “EQ” (energy quotient) rating of 4.99 for this superbly performed set of adventurous music. When the two artists decided to see where a duet situation would lead them, both were surprised at the ease with which they created engrossing, evocative music. “I couldn’t believe how comfortable Judi was with pedals and effects she had never used before.” says Arnold. “And what she did with them was so cool, it was great to improvise with; it felt very free to create along with her.” As for Silvano, she says “Bruce has exactly what I look for in a musician- he is literate, sensitive, and incredibly open in his approach.” To find out more about what equipment was used on this recording please see bottom of page. Travel Chant: Is an electronics excursion with digital effects on both the guitar (using SuperCollider) and vocals (using an array of Eventide effects). Both musicians use their improvisational skills to create evocative compositions and “Travel Chant” is one of the songs that evolved out of a free improvisation. As Judi and Bruce felt their notes altered by the various electronic effects they were triggering, a specific form arose, as of a journey taken alone in uncertain territory. 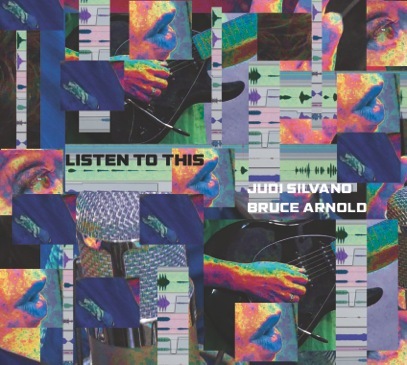 Judi, whose voice is only minimally processed here with reverb, developed a sequence of notes from which the Melody emerged, while Bruce experimented with creating an resonant soundscape. Because both musicians are also composers, there is a sense of structure that abides throughout and allows the piece to develop from ideas through resolution. Listen To This: Although “Listen to This” may sound quite abstract, it is actually a composed piece using two motifs which work as a theme and bridge. Ms. Silvano’s voice is processed through an array of patches that allow her to interact with Mr. Arnold’s SuperCollider processed guitar in a texturally consistent manner. The piece opens with Arnold playing an introductory sound matrix, to which Silvano adds the melodic theme. Close listening then reveals the bridge motif, and the closing section has Arnold restating the initial descending theme. .
Judi Silvano may be best known for her work with some of the Jazz world’s greatest improvisors but her passions extend beyond, to embrace classical and free improv music. Her background in modern dance also adds a spatial element and this is a likely reason that working with Bruce Arnold has been so consonant. Bruce Arnold has been creating soundscapes on the electric guitar for years, using the program SuperCollider. His explorations with 12 tone and pitch class theory as applied to improvisation in both jazz and classical settings lends his playing a distinctive harmonic and melodic voice. Judi Silvano may be best known for her extensive work with some of the Jazz world’s greatest improvisors but her passions extend well beyond, to embrace classical and free improv music. Her background in modern dance also adds an underlying spatial physicality. This spatial element is a likely reason that working with Bruce Arnold proves to be so rewarding. Hailing from Sioux Falls South Dakota, Bruce Arnold has been exploring the potentials of his beloved electric guitar for years, using the program SuperCollider to create atmospheric soundscapes. His fascination with 12 tone and pitch class theory as applied to improvisation in both jazz and classical settings lends his playing a distinctive harmonic and melodic voice. Both artists had been traveling in the same circles without meeting until about three years ago. Surprised at the ease with which they created rich, evocative music they have since made a point of performing and recording together.